There wasn’t anything unusual about this September day. It broke as early as it usually dose at this time of year and by 7 AM it was light enough so I could see my way down the path that lead past the park and into the small shop and yard that was my home away from the office. The scent of the freshly cut field was mixed with just a hint of axel grease and rust. Soon though, at the sun got hotter the smell of ‘railroad’ would over power everything around it. 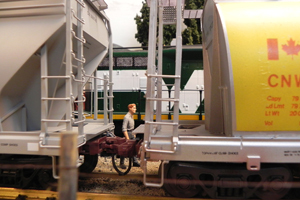 A simple boxcar had already attracted the interest of a dad and his little man. It couldn’t have been the bright red paint turned pink or the load secured to the floor by the open door. Perhaps he was just imagining the places it had been, the story behind the dents, and the face of the buyer in some far away place. I had no use at all for that car but I’d already invested some time and money into seeing it – amongst a bunch of other things. The estate sale was going on and Brian, from Kelly’s Kaboose, had spread the word far and wide. There would be a bargain or three to be had. So by 09:00 I was turning off highway 97 onto ‘the Connector’ and climbing to the Pennask Summit, Merritt and then Kamloops. It was a huge event. The floor was covered with new and hardly used engines, cars, track and structures. But I didn’t really NEED anything. Hmmm. Perhaps this boxcar. I already had this car – same number and all – but with a little weathering….What the hell! For those far a field who haven’t visited the beauty and the wilderness of the Pennask at 5600 feet: http://www.youtube.com/watch?v=YvXkcsFqXK4 Not mine (not trains) but still very nice. By the time I had crossed the tracks and made my way into the shop there was some heat to the day. The mid autumn sun was warm and the sky was bright but much of that warmth was reflected off our snowplow. An ominous sign for sure. Still, it was good to know the boys weren’t going to be surprised by a sudden onset of winter. And that old plow had served us well over the years. She was built on top of an old caboose – greatly strengthened of course – almost 40 years ago and she‘s weathered a few adventures over those years. That big storm in ’05 cut off the valley pretty good. It was four days before she was able to push through and get us connected to the world once again. All this, on top of the day-to-day service which most of us see and expect. I never liked the snowplow by Aristocraft. It was very functional but hugely contrived to me and seeing it used only once with an old brick in the gondola was all it took. I’d have to build my own. It’s fundamentally an old caboose of course. 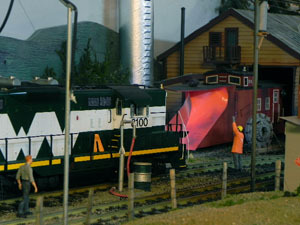 I had the April 2003 Garden Railways magazine supplemental drawings of a 1:29th scale snowplow that were more than I needed to scratch build and I had an Aristocraft steel caboose ART-42100 that I didn’t run. Wall la! The key was the curved form for the plow blade that took the guesswork out of the project plus a number of photos of CN plows at work in northern Ontario. See http://wvrr.ca/prototype/photo_25.htm for example. I spent much of the morning balancing maintenance with customers and personnel just as I have done for going on six years now. Maintenance is done to schedule but it’s also done when we have the expertise on hand to do it. Many of our experienced staff are retired part timers. That’s the way they like it and that’s the way we can afford it but our customers want cars in and out on time. No excuses. A speaker high on a post blasted me back to the office for a long distance call. An issue with the sand dryer would wait. What could that be? An accident? Worse? I found myself running the last 440 and I hadn’t done that since high school. Loree’ was in Edmonton and she was driving up this afternoon. This photo demonstrates the problem I had with the cylinder hopper fleet in G scale. Two major manufactures offered them. 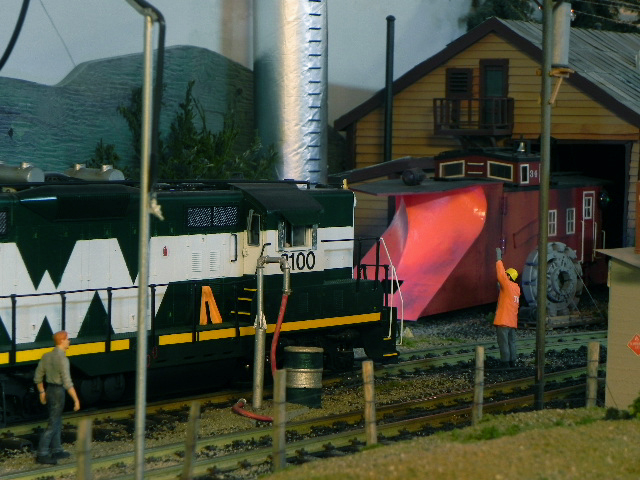 USA Trains has the most impressive fleet – and by far the most detailed. Three CP Rail, 2 CN, Canada, 12 different Alberta, 1 Saskatchewan and 2 Government of Canada. These are most like the CN 388000 series but with 4 hoppers rather than three. The LGB model was for the same CN type with the correct three hoppers but done up in the Canada paint scheme. Fail! So I built my own as seen on the right. It’s based on a USAT frame, (It’s a devil of a job to remove) a cylindrical tank built from drawings in Feb 1994 Model Railroader and some of my own detail photos. People can see the difference. My favourate photo…. Now I really didn’t know what to do. The call was short and to the point as usual. She hated phones. So did she book herself into a hotel? Should I clean the dog hair out of my place? Hell! Did she come to see me or is she just getting in some late season hiking? And I still had work to do. It was the busiest season here and what with work every day of the week for a while it would be evenings only for us – at best. I did know one thing right away though. I wasn’t going to be as productive in the afternoon as I was trying to be in the morning so I just wandered back to the station to do some paperwork and make some calls. Besides, being near the phone was a good thing. You know, just in case something happed. Along the way, Ray was setting up his ‘ride on’ train in the park. His 5-ton was parked by the fence and he was lifting track, engines and various cars out onto the grass. Normally it would have had two men to do this – except for the engines of course. The forklift was always used for those. But there was just Ray that day, and his tiny wife, so the whole shipment was moved mechanically. We talked and laughed for a while about his plans for the Christmas show but that phone call never went away. Funny. I sold off all my N scale stuff (25 years worth) more than ten years ago but lately a few pieces have been showing up in the Okanagan and it seems that most of the cars still have the Winter Valley decals on them. The model railroading fraternity in the valley is a pretty close one even given the distances between cities and so my recent visits to other layouts have made me the receiver of gifts – old and forgotten. 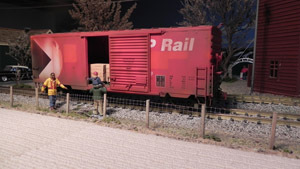 First a small switch engine, then a stock car and a caboose and then a boxcar. It’s unlikely they’ll run again on this layout. No room for starters. But the pressure to lay track and power it up is coming from everywhere. Can’t people understand that EVERYTHING doesn’t have to move? The day had clicked down faster than I’d planned. Faster than I wished. This mornings phone call hadn’t hinted at why Loree-of-the-Past had decided to be a part of the present. And up here in Winter Valley as well. I was at the powerhouse in Pearson by 5:30 with two questions. Did the Pearson Terminal generator have the backbone needed to supply our signal system through a couple of weeks this November and, could I be real handy to that old hotel that had been a huge part of my world over a year ago? I was desperately hoping yes on the former and tentatively hoping yes on the latter. Damn! It sure had been a while. Few words being replied to my many. I being resigned. I moving on. And now this. I heard her voice over the sound of the diesel as I went out to the truck. Resignation and moving on melted away on. I have to talk a moment about one of my biggest issues with the G scale world. No people! N scale, HO scale, O scale. Lots of people. G scale, of any scale, no people. Well not real people anyway. There are cowboys and clowns and brides and firemen and drill sergeants and in some less conservative parts of the world, even hookers. But of real people in real clothes doing real things there’s a serous dearth of invention. So there. Now you know where you’ve seen her fine backside before. Did you also notice that the fellow there, me, is a full head and shoulders taller than the truck? Most people don’t notice. In fact, no one notices. The cars are off the shelf from China and Wal-Mart and the 2 nice people in the photo are from Germany. Odd eh? KARAOKE COMES TO PEARSON – Parents groups protest. Tomorrows headline ran through my mind just for a second and I started to laugh like a kid in church. The entertainment lasted late into the night. The beer tent was ablaze with people and colour. Friends were stopping just to say hello or to sing along. We were an extended family up here and it felt good. Cars had been lined up around the park. Headlights and the glow from the hotel windows cast light on a last sliver of summer. Sure, Loree was only staying the night (a busines thing in Edmonton) but I felt strangely whole for a while and that was a good thing too. This scene, unlike all the other vignettes on the layout, was completely unplanned and set up on a very temporary basis. My small friend Reagan was visiting and she found the singer in my drawer of ‘never to be used’ figures. A 10-year-old fan obviously has a different perspective on these things. So, with the help of some other odd heads, the karaoke scene was born. As I recall, one of the folks in the crowd was extra terrestrial, but that didn’t matter. Everyone had fun. And this hobby is really just about kids having fun isn’t it? Kids of every age playing in an imaginary world of their own making. The singer and the partygoers are all gone now and the park is peaceful but every time I look in that drawer I hear it again. Sweet Caroline and Dancing Queen.